Bill's Drive-In re-opened on Feb. 1, after a brief fall/winter hiatus. It offers hot dogs, chili dogs and root beer... a limited menu, but one that is excellent nonetheless. Focus on what you do well, as they say. I would have featured this bright and friendly place sooner, but my son Jeremy and I visited just a few days before the season ended last fall. So, better late than not at all, the hot dog stand is today's Frugal Floozie Friday feature! You may remember that Bill's root beer made my Top 10 list for 2011; Jeremy summed it up this way: "This is, like, the best root beer I've ever had in my life! It's amazing!" And it is very good, with rich flavor and not too much of a head; when you get a mug of root beer at Bill's, you get a full mug. It's worth stopping by just for the soda alone. But for less than $5 — our mandatory Frugal Floozie Friday budget — you can feed two people... I'm serious! Jeremy ordered a hot dog schmeared with ketchup and mustard, I ordered a chili dog with onions, we made sure to get our root beer, and the total tab was ... drum roll ... $4.30. Yes, you read that correctly! We drove up, parked the car, and before I could even reach to open the window, there was a very friendly attendant already waiting to take our order. He told us our options, we told him what we wanted, and he ran off. I turned to talk to Jeremy while we waited; he uttered maybe one sentence before telling me, "Lunch is here." Our food was brought that quickly. So now that they've reopened, be sure to eat at Bill's. It's a long-time local favorite, and you'll be getting fast food that's also good food. Sat, Feb 4, 2012 : 2:06 p.m.
Love local joints like this. I'm not a big fan of A&amp;W - the quality is mediocre - but I have had some great root beer at some of them. Looking forward to checking out Bill's. Sat, Feb 4, 2012 : 6:52 a.m. I was with a family member last summer and we drove by Bill's and thought it would be neat to take a photo. (since we have a family member with the same name) Some crazy man came running out demanding to know why we were taking a photo. He was not pleasant at all. You lost two customers for life dude...Keep your greasy meat...GO VEGGIE! Sun, Feb 5, 2012 : 5:35 a.m.
Fri, Feb 3, 2012 : 10:51 p.m.
Bill's is probably last of the original businesses from the heyday of what was once a vibrant commercial strip along East Michigan Avenue. Thuderbird Lanes, Sesi Lincoln Mercury, HiFlash gas station, Willow Drive In theatre, Wiard's Surplus (no kidding), etc. I remember eating at Bill's way back in the 60's with my parents and three siblings. Six of us in a '65 Ford Galaxy drinking root beer and eating chili dogs on a hot July evening. Life could be much better then. Sat, Feb 4, 2012 : 1:08 p.m.
Fri, Feb 3, 2012 : 5:42 p.m.
Bill's has re-opened?! 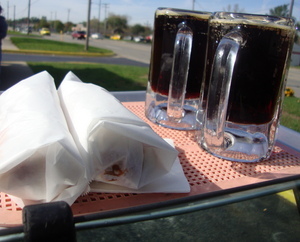 &quot;For lo, the winter has passed...&quot; The best chili dogs and root beer in the area. Nuf Sed- I'll be there tomorrow for lunch. A sure sign of hope and the prospect of Spring, Bill's has indeed re-opened! Fri, Feb 3, 2012 : 5:22 p.m. Always nice to see another generation discover Bill's. Root beer made fresh every day. Hot dogs are made in Detroit to the original Bill's recipe. A true Ypsilanti institution. Fri, Feb 3, 2012 : 5:37 p.m. I like to get a Big Cheese Squeeze with onion rings from Roy's across the street and then a large root beer from Bill's to go with my food. Something about the taste of a Bill's rootbeer with that greasy meat is just PERFECT to me. Another great article Mary, thanks! Sat, Feb 4, 2012 : 6:50 a.m.
You can keep your greasy meat and your clogged arteries...Ugh! Fri, Feb 3, 2012 : 5:31 p.m.
Roy's is on my list of future features ... I'll have to be sure to try your recommendation!